It is a question that sparks a great sports debate. What is the greatest moment in Canadian sports? There are certainly no shortage of candidates. The Toronto Blue Jays winning the World Series. Mike Weir winning the masters. Donovan Bailey's run at the 1996 Olympics. Jackie Robinson joining the Montreal Royals. "Gilles The Thrill" winning the Montreal Grand Prix. Elizabeth Manley's silver skate at the Calgary Olympics. Oh yeah, and then there is hockey. Not surprisingly hockey is very well represented in James Bisson's new book The 100 Greatest Moments in Canadian Sports History. The book, published by Wiley, counts down the nation's top 100 sporting newsmakers. It is very much intended to provocative and controversial, as well as nostalgic and stirring. I won't give away any of the rankings, but I will say hockey does place very well. But I was very much disappointed that Terry Fox's Marathon of Hope did not top the list. Bisson sought the help of some of the biggest names in Canadian sports journalism to come up with his rankings - Stephen Brunt of the Globe And Mail, Dave Feschuk of the Toronto Star, Sean Fitzgerald of the National Post, Derek Snider of The Score and James Duthie and Chris Cuthbert of TSN. Over 300 photographs as well as interviews with the athletes themselves compliment the brief write ups about each of the 100 memories. 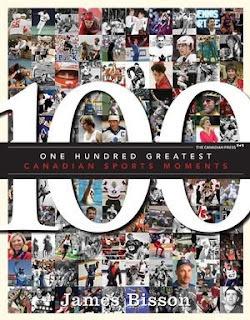 The 100 Greatest Moments in Canadian Sports History is a lavish book that allows Canadian the chance to relive great moments, learn about others, and engage others in what will sure to be a lively debate.